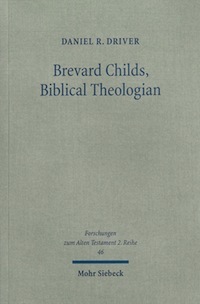 Anyone familiar with Old Testament studies in general and the “canonical approach” in particular is probably aware of Brevard S. Childs. Because of his prominence in the field and the substance of his work, many have undertaken to analyze his approach in detail. In Brevard Childs, Biblical Theologian, Daniel R. Driver seeks to produce just such a work. In a revised version of his doctoral thesis completed at the University of St. Andrews, Driver aims to provide a comprehensive analysis of Childs’ oeuvre and to uncover the inner workings of his brand of biblical theology. After an introductory chapter that surveys Childs’ life and the history of the canon debate, Driver divides his analysis into three main parts. In part one, Driver gives a sort of reception history of Childs’ work both in English and German contexts. He also situates Childs in relation to the Biblical Theology movement and in relation to figures such as Karl Barth and James Barr. In part two, Driver exposits Childs’ canonical approach itself and examines its internal coherence. According to Driver, Childs makes two major shifts or turns in his career. The first is Childs’ movement from a focus on “form” to a focus on “final form” (chapter four). Early in his education and career, Childs accepted the tenants of form criticism and produced substantive work in this area (e.g., his first three books). However, gradually but swiftly, Childs began to see the overall inadequacy of this type of “behind the text” reconstruction. To illustrate, Driver compares and contrasts Childs’ approach with Old Testament form critic Hermann Gunkel (105ff). Childs seeks to answer the question, “Does canonical scripture transcend the circumstances of its creation and provide the Sitz for a community’s life of faith and practice.” Thus, according to Driver, Childs “consciously inverts” Gunkel’s method, “contradicting the usual form critical account in form critical terms.” In this sense, the “the canon itself became the setting for the life of the people, the community of faith” (105). The next major hermeneutical shift that Driver describes relates to Childs’ reflection on the relationship between the Testaments. How the Old Testament and the New Testament actually function as two parts of one Christian Bible was a central issue in much of Childs’ thinking about canon. In chapter five, Driver discusses two options for relating the Testaments that Childs in one way or another rejects (narrative and intertextual readings). In chapter six, Driver charts Childs’ gradual choice of canon over the hermeneutical technique of midrash. In part three, Driver examines directly the second major shift in Childs’ career, which involves the “Mystery of Christ.” Here Driver seeks to situate and contextualize Childs’ adoption of a form of allegory and examines his proposal for a multi-level reading of Scripture. Childs’ concern in this area is to confirm and affirm that Christ is the ostensive referent (the res) of the Christian Bible as a whole. Christ is the subject that both the Old and New Testaments witness to in their own discrete voices. After providing a test case for the issues raised throughout his discussion (on the scope of Psalm 102), Driver concludes his volume with an epilogue that surveys recent work on the canon (inter alia, Seitz, van der Toorn) and how that work might interact with Childs’ approach. He also expresses personal points of agreement and disagreement with the positions that Childs takes over the course of his career. A two-fold strength of Driver’s analysis of Childs’ canonical approach involves biography and bibliography. Driver’s analysis has the advantage of taking Childs’ entire corpus of writings into account. For the first time, Childs’ canon is closed and capable of probing investigation. Driver has also attempted to be exhaustive in his synthesis of complementary primary sources. Thus, he supplements his account of Childs’ academic pursuits with germane (and oftentimes fascinating) biographical data (e.g., personal interviews, anecdotes from Childs, items from Childs’ archives at Princeton, Childs’ personal correspondence with James Barr, etc). One of the consistent criticisms of Childs is that he is inconsistent. Many of those who have studied Childs’ approach have felt a pressing need to reconstruct considerably “Childsean hermeneutics.” This perception of Childs’ approach was encouraged by James Barr’s biting criticism of Childs throughout his career. This critique in particular has helped generate a “bi-polar Childs” in much secondary literature (36-50), a sort of struggle to understand Childs’ work as a coherent scholarship. 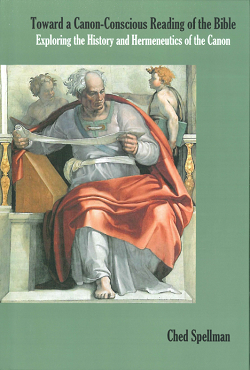 On the one hand, he champions a focus on the final form of the text, but on the other he engages in various forms of historical criticism in his treatment of biblical material. Many critical biblical scholars would decry a privileging of a final form, which they view as arbitrary, and many evangelical biblical scholars would balk at the use of critical methodology, which they view as dangerous. Though one might surely still take issue with either of these areas, Driver maintains the importance of recognizing that for Childs, there is an internal logic to his version of the canonical approach. Driver points out that the “missing link” many critics neglect is the notion of canon consciousness (71, 144ff). Childs’ canonical approach argues that “canon was not a late, ecclesiastical ordering which was basically foreign to the material itself, but that canon-consciousness lay deep within the formation of the literature” (Childs, Biblical Theology, 70-71). Thus, Driver highlights that Childs seems to see an integral connection between the “pre-canonical” forms of texts and traditions and the shape they take in the canon as part of the church’s Scripture. Indeed, though Driver strives for a balanced interaction with critics and a descriptive analysis of Childs’ canonical approach, he also strongly argues a thesis, namely, that Childs’ approach is complex but ultimately coherent. For Driver, what is missing in the contemporary discussion is the historical Childs, or better, the canonical Childs. Driver’s articulation of Childs’ “career thesis” is that “the historically shaped canon of scripture, in its two discrete witnesses, is a Christological rule of faith that in the church, by the action of the Holy Spirit, accrues textual authority” (4). In light of this assertion, Driver hopes “to give some impression of the approach’s aims, what problems it identifies, and how on its own terms these problems are solved or mitigated” (4, emphasis added). Through his analysis, Driver seeks to raise the possibility that “Childs’ promotion of canon as a governing framework need not be seen as dogmatism, obstinacy or the mutterings of a simpleton, but can be appreciated as a knowledgeable embrace of an intricate, knotty subject” (5). Further, the “bi-polar” Childs “lives in an ungainly body of secondary literature” and is “largely a work of fiction, a Frankenstein hatched in an unhappy dream that lingers in daylight much longer than it should” (58). Evangelical and historical-critical scholars alike who are wary of all things "canonical" would do well to situate Childs in his academic context. Driver demonstrates that throughout his career, Childs reflected on the relationship between historical-critical and biblical-theological methods and assumptions. And there are important differences between his application of these critical tools and “business as usual” in the scholarly guilds. Thus, Driver’s volume seeks to clarify what Childs is up to in his canonical approach, so that those who critique Childs’ approach might avoid interacting with a caricature or a shifty phantom that haunts the secondary literature. In one sense, the burden of Driver’s volume is to answer thoroughly the question, “What happens if Childs’ work proves to have a logic of its own, even if it is a logic one finally chooses not to enter?” (59). It is this suggestive yet balanced approach that makes Driver’s volume a helpful hermeneutical guide for reading Childs. One useful feature of Driver’s work is his keen attention to definitions and what is at stake between the two major understandings of canon. As mentioned above, he identifies Childs’ understanding of canon-consciousness as a key element of his approach: “Above all, though, an alternative vision fires Childs’ insight ‘that canon-consciousness lay deep within the formation of the literature’” (150; cf. 21ff; 71; 124; 149; 151; 158; 161ff, etc). Driver has a helpful chapter on the nature of narrative analysis and intertextuality, both options that Childs does not fully integrate (though Childs is still comfortable with a carefully circumscribed notion of intertextuality). For Childs, intertextuality is a strategy the prophets utilized in order to affirm the “inner logic of Scripture’s textual authority” (101). Driver also traces the important and lively (sometimes vitriolic) exchanges between Childs and James Barr. I was not aware of how intense and persistant this career-long critical "dialogue" was between these two important figures and almost perfect contemporaries (Childs: 1923-2007 / Barr: 1924-2006). In the appendix (287-91), Driver produces two personal letters from Childs to Barr from Childs' Princeton archives (two entries in the "long chain of disagreements" between the two scholars). In this analysis of Childs and his critiques, Driver seeks to remain balanced in his commentary. Thus, where he sees merit in critiques of Childs, he lets them stand (e.g., in Childs’ curious wholesale rejection of “midrash”). In the epilogue, he also points to the places where he sees "room for growth of understanding" (282). Driver gives a chronological bibliography of Childs' books, articles, and reviews (293-99), which serves as a valuable resource. However, because the citations are abbreviated in the footnotes (a simple truncated title), locating the bibliographic data of one of Childs' articles in particular is sometimes cumbersome (since one has to determine which decade the article is from). Adding a date along with the article title might mollify this concern. On the one hand, this book is a very academic work. It's the distillation of a dissertation; The discussion assumes an understanding of the way biblical studies analysis functions; the German is untranslated; many parts delve into technical details, etc. On the other hand, because Driver's prose and method are clear, the result is a challenging yet enjoyable read (there are a handful of delightful play on words and lucid metaphors lurking in the shadows as well). The companion website for the book (which is excellent and aesthetically robust! ), which is a subsection of Driver's personal website. Driver provides a biographical sketch of Childs, a hyperlinked (when available) bibliography of Childs' sundry articles, books, reviews, and a selected annotated bibliography of secondary literature interacting with Childs. An American edition of the book is slated to be published by Baker in 2012, which should be more accessible and more reasonably priced.